Here's a project that I'd been dying to do for a while. My first thought was to turn the tray into some sort of picture frame, but then, I decided that I was lacking a calendar for my window sill. The 7 Gypsies tray was bought from HK Memory Chest (they still have them in at the moment, in black or white, so get one quickly). They are only 6.5" x 6.5", so make a quick and easy project. 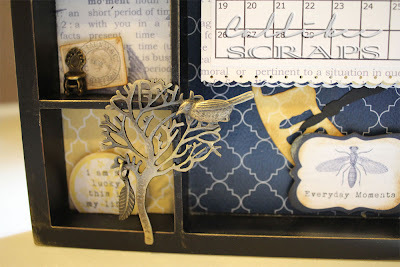 I used Teresa Collins papers from her new Every Day Moments collection. I actually got her papers from the CHA where she was doing mini album "make and takes". Instead of completing the album, I took it apart and used the papers in this project. 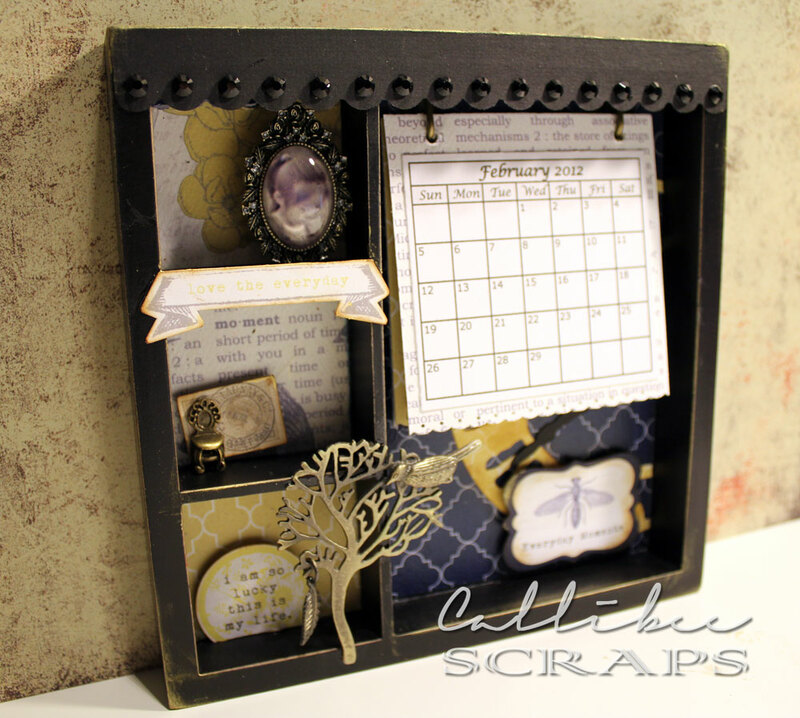 The trinkets were sourced from Sham Shui Po, a mecca for scrapbookers looking for that something extra to put on their layouts. They sell anything from buttons and beads, to ribbons, trims, appliques, feathers and jewelry pieces. Love that place. I could browse for hours and hours, up and down those streets. Patterned paper was cut to size to fit the inserts. I then used mod-podge to seal the edges and to give it a nice waterproof coating. I used Excel to create the calendar and stuck one month on each side of six pieces of patterned paper. I printed and cut out a tiny picture of Miss C to place under the glass pendant. I used Glossy Accents to seal the pendant but in future, I may try something else as it seems to leave tiny air bubbles in between which I couldn't get out. 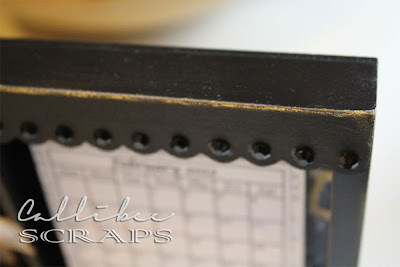 I punched out a strip of black cardstock and stuck it to the edge of the tray, sanded it and added a little gold acrylic paint to make it blend in and look seamless. A row of black bling completes the tray. Trinkets were stuck on with Glossy Accents to give them the extra strength and support they needed. As most of the trinkets had a necklace loop, I used a pair of wire cutters to take them off and sanded down the raw edge. 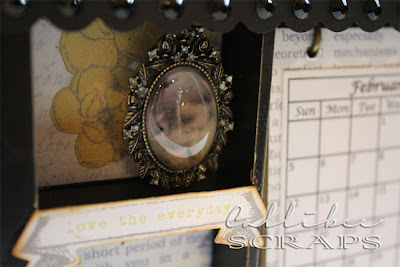 I love the roman-numeral clock die-cut peeking out from under the calendar.